The transformation of a human into an alien species is a concept that intrigues science fiction fans. Vlane Carter takes this idea to extraordinary lengths in his new series The Bialien Trilogy. The first book, Rise of the Bialiensapien: Human Evolved, sets the stage for the weird and bizarre, propelling his nineteen-year-old main character, Jaden Marino, into the depths of imaginative heaven and hell. When this daring protagonist discovers a UFO in upstate New York, it is a race against the US government. Within this spaceship lurks not a monster, but technology so sophisticated that it could either advance our civilization, or in the wrong hands, be used to destroy us. The peaceful Andromedians are seventy thousand years ahead of us. 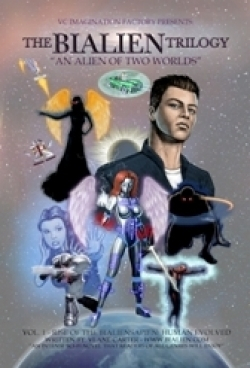 Jaden leaves Earth in 1996 and returns eighteen years later to face an alien conspiracy. This talented author tells his amazing tale with a sense of humor. Integrated into his high-tech descriptions and scientific “jargon” are one-liners, even a touch of political comedy and social commentary. Witty and savvy in his approach toward a looming 2014 calamity, his hero is a superpower with highly developed communication abilities and a transformed body that can withstand unthinkable torture in space-lab and hospital scenarios that are graphic enough to cause a reader to shudder in revulsion. This may be the story’s strong point or downfall, depending on expectation. At nearly seven hundred pages with fine print, this work is a daunting undertaking for a first novel. In this case, the old adage that more is not necessarily better, applies to the manner in which the unrelenting action scenes are implemented. Though a fast-paced delivery is an asset in most commercial fiction, Rise of the Bialiensapien goes too far in not slowing down at various points to give the reader a “breather” and to reorient the focus of the story as the settings change. More than any other factor, the lack of content control and the need of more meticulous line editing, including the necessity to remove text, has brought what could be a stellar piece of fiction to a lower level. The ingenuity behind this work, however, exceeds the average science fiction novel. This series holds incredible potential for development not only into novels, but games, comic books, and even films. The story is told in the present tense, giving a sense of immediacy lacking in traditional fiction. It reads much like a screenplay, emphasizing the visual aspect of the work over any other element. Complex to the point of including a “primer” at the beginning of the book to prevent confusion, this thought-provoking, complicated story will appeal to open-minded readers with patience and a desire to probe the possibilities that may exist in extraterrestrial worlds. Vlane Carter has been fascinated with science fiction all his life. He hopes to create a new generation of sci-fi that will incorporate present and future science into the plot. His distinctive mix of current technology and fallible human reality with fantastical visions of a changeable future will undoubtedly spawn countless stories.